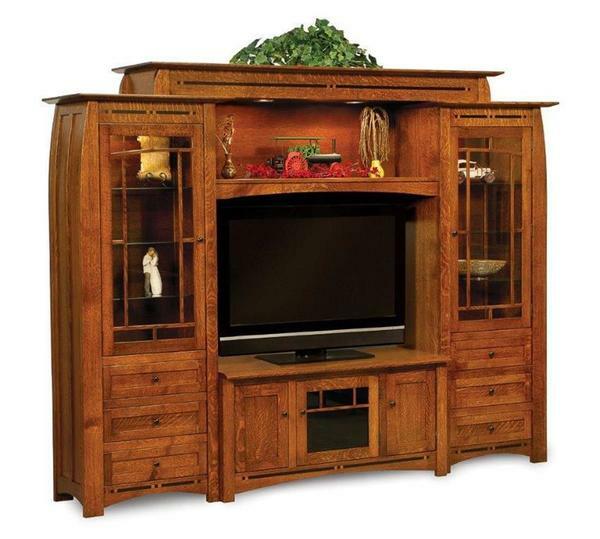 Truly a feast for the eyes, the Amish Boulder Creek Entertainment Center will take your living room to new heights with an exceptional collection of solid wood features the whole family will enjoy. This solid wood masterpiece displays the quiet strength and beauty of mission style furniture while it stores, displays, organizes and adds something special to your family gatherings, all the while serving up a custom made style that you had a hand in designing. This is a collection custom made for your family. This mission furniture includes a solid wood television stand, customized storage space, curio cabinets to display your family's story, a hutch top to showcase items and an heirloom quality that will shine from every angle. Handcrafted by the Amish means custom made furniture for your home. Watch the features and options you're looking for come to life in this exceptional home entertainment center. Be sure to view the matching Amish Boulder Creek 10 Shelf Bookcase and the Amish Boulder Creek Open Sofa Table with Drawer to add to your living room or family room display. Please call one of our friendly Amish Furniture Experts for assistance with your order. We can be reached toll-free at 1-866-272-6773. Here are some photos of this fabulous entertainment center in cherry. I will take a few at night to maybe eliminate refection.